An integral component to the Puckmasters training system is its high quality strength, speed and power training facility. 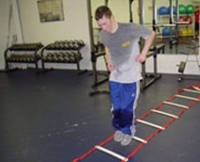 The goals of the strength and conditioning programs are to develop hockey players who are stronger, faster, more powerful, flexible, metabolically more efficient and less prone to develop injuries. The strength and conditioning staff works very closely with its members to provide individualized attention to each player's specific needs and goals.